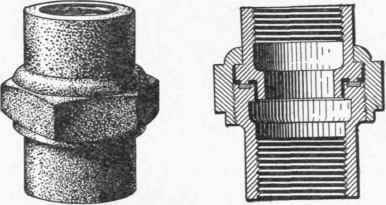 The distributing pipes inside of a house are usually of wrought iron, except where exposed in rooms, or carried along walls lined with enameled brick, or tile, in which case they may be of polished bass, or copper. The chief requirements for wrought-iron distributing pipes are that they be carefully welded and perfectly circular in section. The first is important in order to avoid splitting when cutting or threading them on the pipe bench. All gas pipes are put together with screwed joints, a thread being cut upon the outside. When the pipe is irregular in section the threading will be more or less imperfect, and as a result the joints will be defective. A good gas fitter must examine all pipe as it is delivered at the building, and observe the section either by means of the eye or by the use of calipers. Plain wrought-iron pipe is likely to rust upon the inside, especially where the gas supplied is imperfectly purified, and for this reason it is often advisable to use rustless, or galvanized pipe, for the smaller sizes.